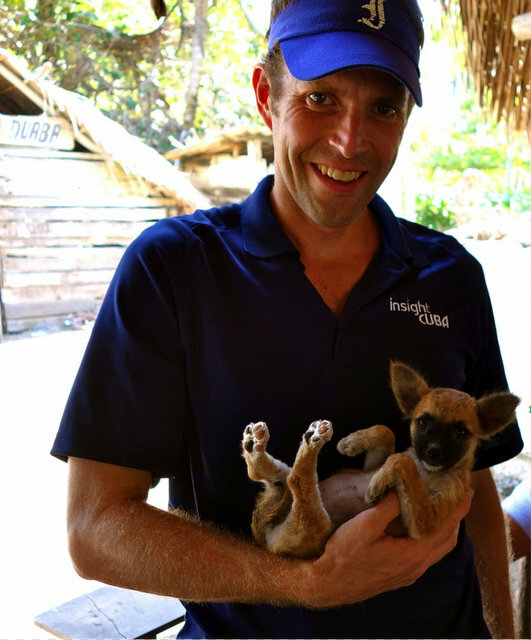 InsightCuba caught up with Jeff Phillippe, an insightCuba tour leader that used to spend his days guiding mountain expeditions all over the U.S. and South America. With over fifty trips to Cuba, Jeff discusses why Cuba is his favorite place to travel in Latin America and how first-time travelers to the island can experience the authentic Cuba he has come to love. Jeff Phillippe: My background is quite diverse. I have worked for ten years leading wilderness expeditions all over the U.S., Patagonia, and Peru. I taught secondary Science and Geography for five years, and I have a Masters in Water Resource Science, for which I used to lead water evaluation surveys in rural areas of Central America. Originally hailing from upstate New York, I now consider myself to have geographic commitment issues. I have been living out of a backpack for six years now, bouncing between leading tours and traveling independently, mostly in Latin America. Truthfully, if I spend more than three months in the same place, I start to get edgy. In my free time, I enjoy rock-climbing, running marathons, and going to the cinema for 8 cents in Havana. After doing a 15-month backpacking journey around Central and South America, I had decided that Cuba was where I wanted to be. 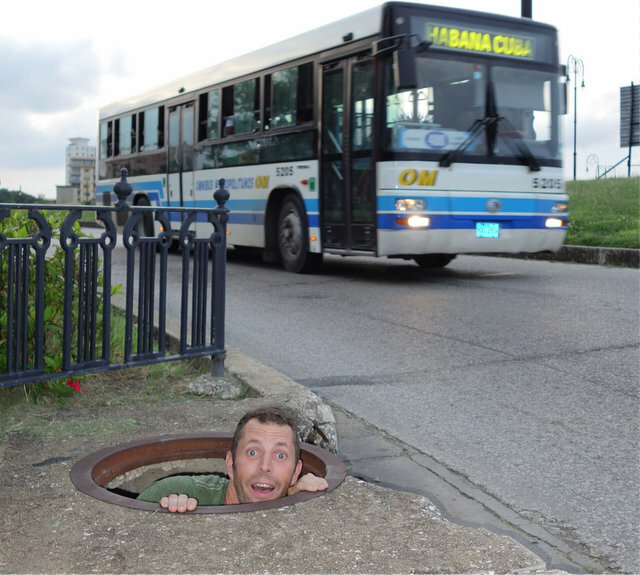 Traveling in Cuba is such a unique experience. The way people take on struggles with a sense of humor is inspiring. I have never laughed so hard in my life as I did while on my first visit to Cuba. And of course, there is the music and dancing, which I have fallen in love with. Leading educational and cultural tours around Cuba has been a refreshing break from guiding mountain expeditions, but in the end, I use a similar skill set regarding group dynamics, pushing people’s comfort zones, and enhancing adaptation to new environments. 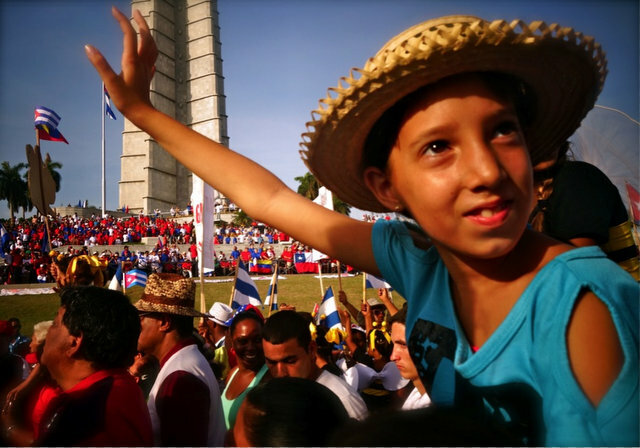 A young girl from Havana gets a boost to get a view of the May 1st Worker’s Day Parade. I love working for insightCuba because I get to do so many types of trips. Many companies only offer one or two standard trips. With insightCuba, I have led twelve different types of trips into all parts of the island, including exchanges with doctors, lawyers, geologists, and artists. Favorite insightCuba tours that you lead and why? 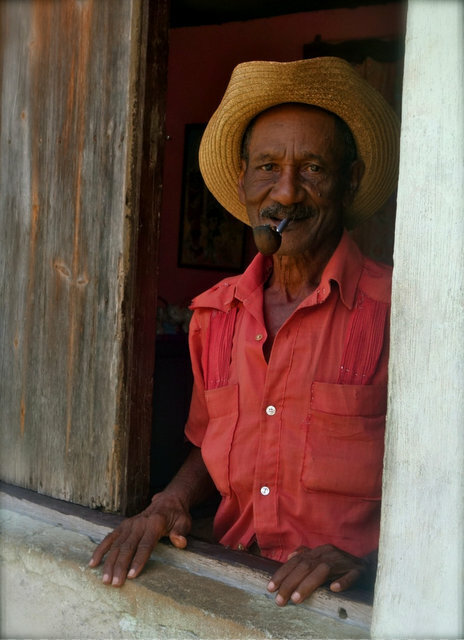 Hands-down, my favorite insightCuba tour to lead is “Undiscovered Cuba.” It takes our guests off the beaten path and penetrates the Eastern provinces, which is my favorite part of the island. The tour finishes in Baracoa, an isolated city in the remotest region of Guantanamo. Here people live simply, and the stunning mountains, rivers and sea play an integral role in their daily lives. Residents here are the happiest and friendliest people I have met in all of my travels and I consider many of them to be family. It is an absolute pleasure to introduce our guests to them. Havana is also a marvelous city to explore. For me, it ranks alongside Rio de Janeiro and New York as three of the most jaw-dropping cities of the Western Hemisphere. But to experience the authentic Cuba, the time-warped country that you have dreamed about, you have to penetrate deep into the provinces. My greatest reward is seeing guests actively interact with Cubans and getting a clearer sense of what life is like here. People-to-People travel gets a lot of criticism by anti-Cuba congressmen and senators, who think we are putting on a show in Cuba, failing to show the realities of the Cuban struggle. On the trips I lead, this is far from the truth. The majority of our activities include a time for conversation with the hosts and debriefing. Life in Cuba is hard. People have to use creativity to get by. Cubans are eager to share their stories and my guests have learned a lot from them. A “guajiro” in the Sierra Maestra mountains of the Granma province. I like the fact that you can’t figure out this place in one trip. In fact, I’ve done more than fifty trips here, and this island still perplexes me. As you travel from one country to another in Latin America, cultures and histories can become repetitive. Cuba is different from anything else you have seen. For this reason, a guide I work with encourages groups to “reset their hard drives” when they arrive to Cuba. Systems are different here. How do people get by on the average salary of 20 dollars a month? Why is there relatively no crime here? You will slowly learn the answers as you interact with people here. And you will probably return home with more questions than you had when you started. On day 10 of the “Undiscovered Cuba” trip, my group was loving its first full day in Baracoa. We visited the home of old friends, shared juice and stories on their terrace, and talked about how folks “get by” in the Cuban countryside. We proceeded to walk to their relative’s home, a very modest, wooden structure, nestled by a stream. The guests were in awe of how welcoming everyone was as we walked through their property. Suddenly, their 14-year old niece jumped out of the muddy forest with a machete, dressed as an old “guajiro,” or country peasant. Our startled guests then enjoyed a ten-minute act that she had previously put on her for her school. 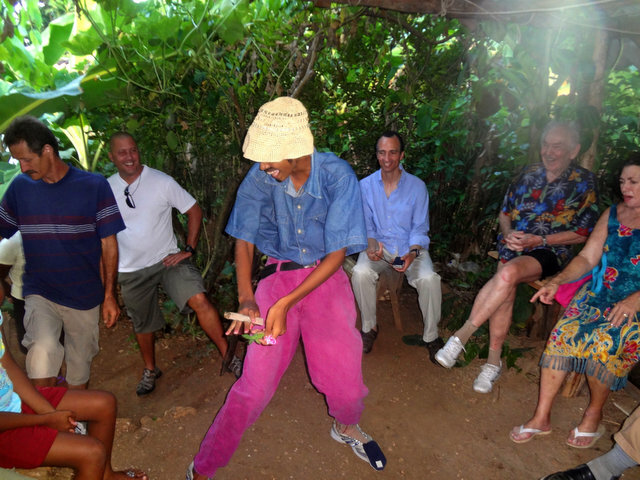 They laughed and danced and embraced the moment, just as any resident of Baracoa would. I’m still waiting to experience my “worst” day. Do as the Cubans do. In your limited free time, go to the markets, the sporting events, the evening peñas (local dances and live music). Use Cuban pesos, the locals’ currency. In whatever city you are in, skip a dinner and go to El Copelia instead, where you can wait in line for a 20-cent ice cream sundae. Walk the streets of Central Havana. Peek in the windows of the locals’ homes. Get invited into their homes. Talk to strangers. Don’t focus on your time in hotels and restaurants. Those are not the experiences you’ll remember. Ask a lot of questions and return home with more. Come to Cuba as soon as possible. You never know if senseless politics will prevent us from going there in the near future.